The original Irish name for these figures of folklore is lobaircin, meaning small-bodied fellow. 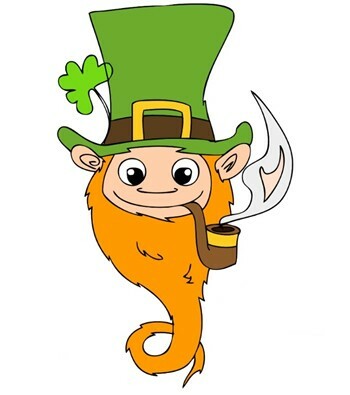 In Irish mythology, a leprechaun is a type of male faerie said to inhabit the island of Ireland. They are a class of "faerie folk" associated in Irish mythology and folklore, as with all faeries, with the Tuatha Dé Danann and other quasi-historical peoples said to have inhabited Ireland before the arrival of the Celts. Leprechauns usually take the form of old men who enjoy partaking in mischief. Their trade is that of a cobbler or shoemaker. They are said to be very rich, having many treasure crocks buried during war-time. According to legend, if anyone keeps an eye fixed upon one, he cannot escape, but the moment the gaze is withdrawn, he vanishes. Leprechauns rarely appear in what would be classed as a folk tale. Stories about leprechauns are generally very brief and generally have local names and scenery attached to them. In most tales and stories leprechauns are depicted as generally harmless creatures who enjoy solitude and live in remote locations, while in others they are depicted as ill-natured and mischievous, with a mind for cunning. Opinion is divided as to if they ever enjoy the company of other spirits. Although rarely seen in social situations, leprechauns are supposedly very well spoken and, if ever spoken to, could make good conversation. Among the most popular of beliefs about leprechauns is that they are extremely wealthy and like to hide their gold in secret locations, which can only be revealed if a person were to actually capture and interrogate a leprechaun for its money. Another popular belief is that you may find a leprechaun and his pot of gold at the end of a rainbow.